This is Electronics engineering seminar topic. Satellites and other space equipment are constantly prone to dangers posed by solar radiation and cosmic rays. The effect of cosmic rays on semiconductor materials results in errors which sometimes lead to devastating consequences. These errors, classified into soft and hard errors are to be kept in mind while designing the electronic equipment that is to be used in space and for other precise equipment. Single event errors are such anomalies in computing systems caused by the cosmic rays emanating primarily from the sun. Single event upsets were first detected by technicians manning electronic equipment after a nuclear test. Eliminating these errors involves testing the vulnerability of the equipment in the presence of different kinds of radiation in different kinds of materials and in different conditions. You can also Subscribe to FINAL YEAR PROJECT'S by Email for more such projects and seminar. The method of preventing these errors is two fold - one called ‘hardening’ and the other, ‘logical’. Technologies like heavy ion testing are being used to predict the behavior of electronic materials when exposed to ionizing radiations. The data obtained from these tests is used to determine the best materials to shield the electronic circuits from the radiations in the case of ‘hardening’. In the case of logical techniques, usage of parity bits and other redundancy checks to counter the effects of the radiation is followed. 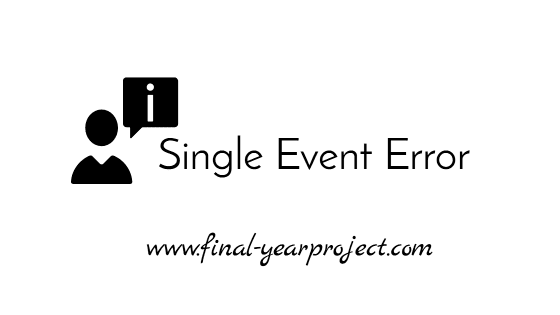 This paper is an effort by the authors to introduce the topic of single event errors and discuss the possible ways of avoiding and/or correcting them. A single event effect (SEE) evolve from, as the term suggests, a single, energetic particle. The possibility of single-event upsets was first postulated by Wallmark and Marcus in 1962. The 1st real satellite anomalies were informed in 1975. Some of the early pioneering work was by May and Woods, who investigated alpha-particle-induced soft errors. In their work the source of alpha particles was not from space but rather from the natural decay of trace (ppm) concentrations of uranium and thorium present in integrated circuit packaging materials.